Ruffles and Bow Ties: July is here!! Can you believe July is already here?!?! And on this holiday weekend while you are hanging out with friends and family, take some time to visit the etsy shop! 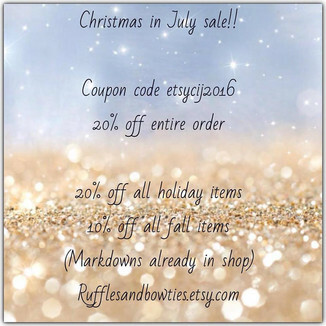 The Christmas in July sale is up and running! I have marked down all the holiday/Christmas items 20%! That's right! All those cute adorable girls holiday dresses and outfits are marked down 20%. I've also marked down fall items 10%. I'm thinking gifts!!! On top of these mark downs, I have also given a coupon code etsycij2016 to receive 20% off your total purchase! What?!!? yes, so on top of those marked down prices you get additional discounts. Head over and stock up now! It's never to early to buy Christmas gifts! Plus, save on all those adorable baby gifts, monogrammed gifts and kids clothes! If you haven't visited the etsy shop (what is stopping you? Click on the link above!) I have also added some super cute, adorable monogrammed baby items. These are by far some of my favorite! New, simple, yet fun design! Over the next few days (until the 10th) I will highlight some of the items for sale. But don't wait! Remember the majority of my items are limited edition items, there's only so many listed (made!). So, while you are at the beach this weekend, or lake house, or waiting for the fireworks to start Monday evening, take out your phone or laptop and visit the shop and do some shopping! And remember, shop small, support small businesses! We work hard, doing what we love! Our customer service is 100 times better then department stores. Our quality is amazing. We care! And your money isn't going to a giant CEO, but to our families. Our profit supports dance lessons, travel soccer fees, and in our case this month a church youth retreat and our family mission trip! We appreciate our customers, we love them and their support! Thank you for shopping small, supporting my tiny business and so many others! Spread the word and share Ruffles and Bow Ties with your friends and family!